Officials from the DPI and Trademark Office met with local businesspeople to educate them on the upcoming Madrid Protocol for International Trademark Registration and to encourage entrepreneurs to apply for trademarks as soon as it is passed by Parliament. The Department of Intellectual Property (DIP) held a seminar for local entrepreneurs on the upcoming AEC and the importance of trademark registration and how to register their own trademarks under the Madrid Protocol for international registration of marks. 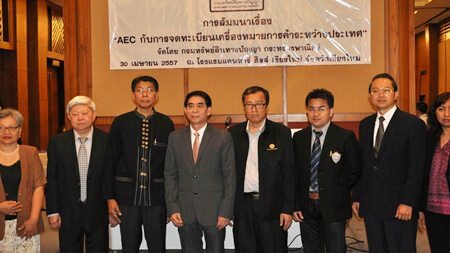 The system will become widespread with the full implementation of the AEC next year, the Deputy Director General of the DIP, Somsak Phanichayakul remarked. The seminar, which will also be held in the North east at Nakhon Ratchasima and Samut Prakan in the Central region, was held at the Kantary Hills Hotel Chiang Mai on April 30, 2014 and saw representatives from related agencies, institutions, the Thai Chamber of Commerce and the Federation of Thai Industries of all nine provinces in the North including Chiang Mai, Chiang Rai, Lampang, Lamphun, Mae Hong Son, Nan, Phayao, Phrae and Uttaradit attend the event. Voravut Posaganondh, Director of the Trademark Office said that the Department of Intellectual Property (DIP) had arranged the seminar to focus on the main issues on the international registration of trademarks or Madrid Protocol an important tool for increasing demand for their products or services. The Deputy Director- General at the Department of Intellectual Property also stated that the department plans to be a member of the international trademark registration or Madrid protocol in 2015. This will help Thai entrepreneurs to ask for trademark protection in other countries more conveniently and economically. Currently there are 91 countries joining this trademark protocol. In the ASEAN community, three countries are already members of the Madrid protocol; Singapore, Vietnam and Philippine. The DIP has prepared to join the Madrid Protocol since 2005 by amending laws and organizing the necessary technology to connect with the trademark registration system of the World Intellectual Property Organization. Thai Parliament approved Thailand’s membership in the Madrid Protocol on October 16th, 2012. However, the draft amendment of the Trademark Act for the affirmation of membership is currently being considered by the Office of the Council of State. It is expected to be proposed to the Cabinet and Parliament in the name of the Commerce Ministry for completion immediately after the election for Prime Minister is completed. This is the second part of a two part series on the financial issues expat women face. Even if you believe your current financial situation is easy for you and/or your spouse to manage on your own becoming an expat will immediately complicate your financial situation and overall life considerably. Tax Accountant. Unless you are retired and plan to keep most of your financial assets in your home country, you will need to find a tax accountant who understands expat tax issues – especially if you are American and have worldwide tax and financial reporting obligations about overseas financial assets. A tax accountant who understands expat tax issues will cost more than your typical tax accountant, but he or she can end up saving you significant amounts of money by ensuring you are in full compliance with all applicable tax laws and asset reporting rules. Attorney. While sites like Legalzoom.com and various legal software programs are very useful for helping you to come up with some basic estate planning documents like wills and power of attorneys, it’s always a good idea to have an attorney look over such documents. It’s also advisable to have an attorney in the country where you will be residing (and ideally one who is familiar with you home country’s laws) to also take a look at all of your estate planning documents to make sure they are not in conflict with that country’s laws. Insurance Expert. Insurance is all about protecting you from risk and unforeseen accidents, but many expats fail to have the right amount or the right kind of insurance. Specific types of insurance you need to carry as an expat woman or ensure that your household has would include expat health insurance that covers medical evacuation to your home country; life insurance on anyone whose income you are dependent on as expats are usually ineligible for unemployment compensation from their home countries; disability insurance as most Western countries do not allow you to collect or even file for disability compensation while living abroad; long-term care insurance if you are near retirement; and some sort of umbrella liability insurance to cover your home, car and any other property in the even of an accident, disaster or theft. With all of that in mind, an insurance expert should take a look at your current coverage and see where there might be gaps or the need to purchase additional coverage. Financial Adviser. Having expert investing and financial planning advice will be critical for a comfortable retirement with the best financial advisers being those who work under the fiduciary standard rather than the suitability standard. Under the fiduciary standard, financial advisers are required to put their own interests below those of any clients and are required to provide information that is as accurate or complete as possible while avoiding conflicts of interest. This means no commissions paid by investment firms for selling or pushing their financial products. Instead, such financial advisors earn income by charging a small annual fee that is the percentage of the amount of assets under management - meaning there is an incentive to grow your investment account while avoiding both risky investments and excessive trading that generate commissions. Finally and as an expat, be sure to find a financial advisor who is licensed by proper regulatory authorities both locally and abroad (e.g. the US Securities and Exchange Commission) as the world of financial advice for expats is often like the wild west filled with scams and dubious investment products or salesmen masquerading as experts. How often should you consult with all of these experts? Generally speaking and unless your life or financial situation is overly complicated (e.g. you have a business in a foreign country) and baring any major changes in your life, you would only need to consult with an attorney and an insurance expert once every few years while it’s a good idea to consult with a tax accountant near the end of every financial year and of course before you must file a tax return or fulfill any asset reporting requirements (e.g if you are American and maintain large overseas financial accounts). You should schedule a meeting with your financial advisor at least twice a year (towards the end of the year around the time you consult with your tax accountant and near the middle of the year to review your financial plan, goals and investment performance) or more if your financial situation is overly complicated or if the markets are particularly volatile. It is important that you and your spouse select an advisor who you BOTH feel comfortable working with together or alone and can build a good rapport and long term working relationship. Wives will statistically tend to outlive their husbands and it will be important to have some continuity when it comes to financial advisory should you outlive your spouse. And while you might be comfortable working with a financial advisor who is in the same age bracket you are in, this may not make much sense if you are near retirement or already retired because your financial advisor will also be thinking about retiring - meaning you will have to look for a new one when he or she leaves the business. The expat life is not just for men anymore as women of all age brackets and marital statuses or family situations increasingly work and/or retire abroad. Keeping the above issues in mind and seeking out the right expert advice will go a long way towards helping you as an expat woman to live a long and comfortable life abroad. The new luxury Baan Chiang Mai Riverside condos has pricing similar to Bangkok. Despite the political issues being faced by the country, the local condominium market is showing no signs of being affected. 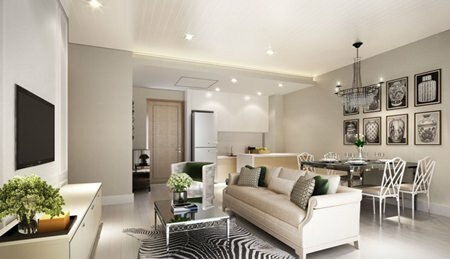 In fact, asking prices for high quality projects under construction adjacent to the Ping River have reached a new benchmark with The Baan Chiang Mai Riverside, an exclusive, luxurious 14 unit development just south of the city, quoting prices if Baht 150,000/m2—such pricing akin to some new projects in the capital Bangkok. With 1-2 bed units ranging from 65m2 to over 120m2, and offering 3-4 different interior fit outs, The Baan Chiang Mai Riverside appears to offer something for everyone. The official launch is planned for July but more details can be obtained from Perfect Homes at this time.